Attached is the inaugural newsletter of enthusiasts dedicated to sharing the Chaparral story. Although the group works independently of The Petroleum Museum, we share in their enthusiasm to tell the story. We have agreed to release this initial newsletter via The Petroleum Museum Chaparral "Live Drive" list. you would like to continue to receive this newsletter please send an e-mail request to Wallace Craig at pancho@biggolddog.com. 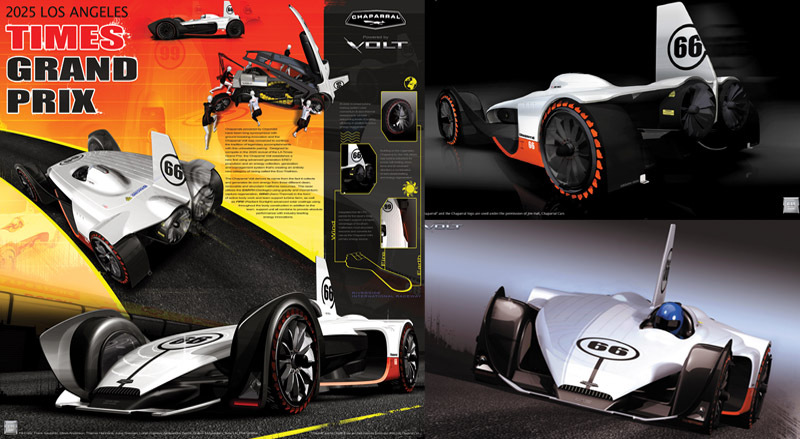 GM designed a new concept car for the future: the Chaparral Volt. 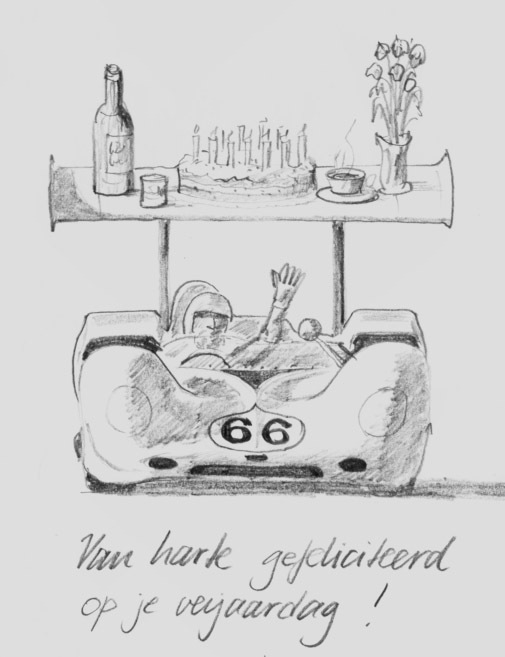 The name "Chaparral" and the Chaparral logo are used under the permission of Jim Hall and it features the famous #66. The car collects and generates its own energy from three different clean, renewable and abundant California resources: Earth, Wind and Fire. For more information see http://www.laautoshow.com (not online anymore, Sept 2016) and Google. In my opinion, Luigi Colani is one of the best designers of our time. He certainly is one of the most controversial and original. For those who don't know this modern 'Leonardo da Vinci', take a look at http://www.colani.ch. I have a few books about this genius. In one of them, Designing Tomorrow (Car Styling Special Edition No. 23), the following drawing is featured (text is quoted from the book). "The racing car 'Chaparral' with an automatic transmission system which made its appearance on the world's motor sport scene between 1964 and 1967. Colani showed its maker Jim Hall what its road version should look like. 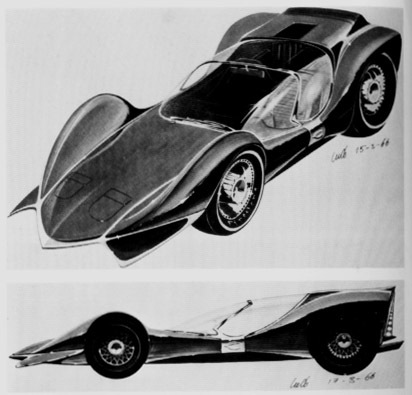 Judging from the design trend represented, it is presumed that the original used by Colani for modification was Hall's second work, Type C."
I think it's a very nice study and there is some relevancy in the subject actually. 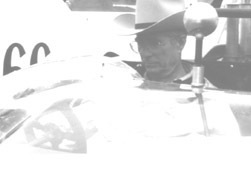 Jim Hall is said to have toyed with the idea of producing a series of road going sports cars in the Sixties. It never became reality however. Colani had already designed a VW based body kit, the Colani Spider. About 600 are claimed to be produced in the same period. Some survived and can still be seen at VW meetings. The fact that this Marcello Ghandini design of the early Seventies, to my knowledge, never has been compared with the Chaparral 2H is probably due to the fact that the 2H was relatively unknown in the old world. But there are too many similarities to speak about coincidence and I suppose Bertone took a very close look at the 2H concept at the time: overall profile, driver position, radiator in the very back, fed fresh air by making use of the boundary layer, air intakes at the sides, the side windows and the front screen. In the Stratos' case the front screen doubles as the entrance hatch whereas the 2H had a separate entrance opening, but nevertheless..
My brother in law sent his congratulations by fax. He's not a bad artist, is he? I wish I had that tray at home!